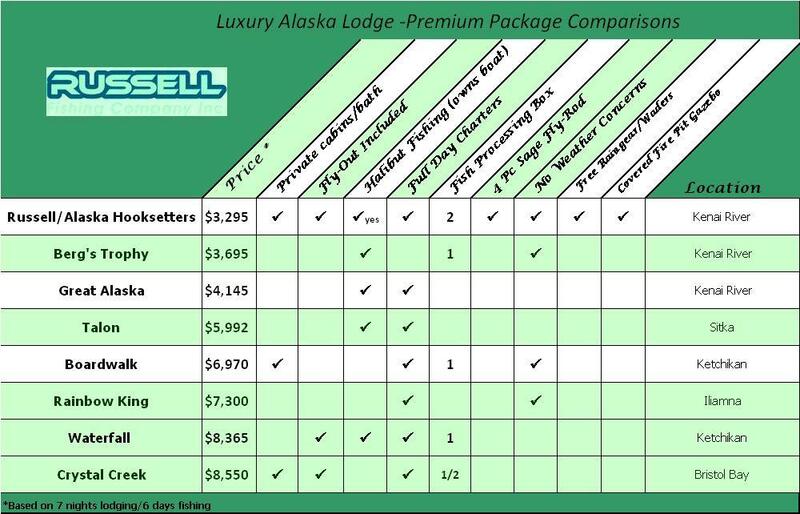 Use below checklist to compare packages and price/value between lodges. Compare prices and call or email Cap'n Gilz and let him make a no-obligation proposal. Book a package or customize your own trip. If you don't see what you want . . .
Alaska Hooksetters Lodge vacation packages and pricing also make it different! From lodging/meals only, to a la carte activities, to vacation packages that combine fishing charters with sightseeing tours, fly-in trips, Alaska adventures and relaxation, Alaska Hooksetter’s Lodge is the best value on the Kenai Peninsula. For the avid fisherman and their group, we can “fish you ‘till your arms collapse” with our in-house guide service, Russell Fishing Company, but Alaska Hooksetters realizes that this philosophy isn’t for everyone. We welcome you to enjoy our website and make your own decision. We've worked hard to help it give you a real flavor of what an Alaska vacation at Hooksetters Lodge will be like. If you see a photo you like, try clicking on it to see a breathtaking full size image. Browse through our pages on the available fishing charters for salmon, halibut, trout, fly-in fishing trips, Kenai Peninsula adventures, flight-seeing and photography tours, and most of all our Kenai lodge and cabins. Also look out for some "key facts & trivia" - because there isn't much about Alaska that isn't big, different and truly interesting . . .
Alaska Hooksetters and its affiliated fishing guide service Russell Fishing Company (www.russellfishingcompany.com) believe that species of many fish, especially native runs of anadromous fish deserve a concerted effort, toward improved sustainability, from commercial, sports fishing and international interests. Better fishing for future generations of fishermen can be promoted through catch and release when it makes sense to do so. 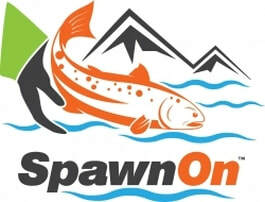 Alaska Hooksetters has trademarked a “Spawn On” logo (see attached) and web link and is encouraging their business associates, guests, friends and family to wear or use the logo proudly, supporting their long-term endeavor. In addition to publicizing the need for managing our fisheries resources, Alaska Hooksetters Lodge is donating $1 of each merchandise sale for scholarship programs in fishery and marine biology. The unique Kenai King Salmon is only a starting point. Alaska Hooksetters and Russell Fishing are not mandating catch and release on this iconic fish, but asking guests to make it a consideration. In some instances, guest may even have incentives to release caught fish. There are currently plenty of opportunities to take fish home for table fare. i.e. abundant sockeye, silvers and halibut. Other Kenai area resident fish like the native rainbow trout and steelhead are already part of catch and release regulations. In other areas of the world, Atlantic Salmon have been part of similar initiatives. Fisherman targeting many saltwater species like the magnificent Marlin, and Tarpon are practicing catch and release already and will be invited to join the Spawn On initiative. For more information on Spawn On, visit (www.spawnon.com) or call 541-254-0679. Appropriate packages include all meals (Dinner on own Thurs night so our chef can have a night off), gear, bait, tackle, rain gear, waders, auto inflate life vests, "flight ready" fish processing for your catch and full housekeeping services. Note: We recommend a Monday-Sunday stay for most packages. The Kenai is closed to guides Sunday and Monday and the Kasilof is closed Sunday. A Monday through Sunday stay allows you to start fishing prime waters immediately without fighting crowds for open venues. But of course, we will accommodate your specific scheduling needs. 8 days to experience Southcentral Alaska.This is the Supreme package, (all inclusive with all meals) with fully guided fishing trips for Halibut, Salmon, Trout and includes a Premium Fly in Adventure. Enjoy 7 days and 6 nights (all meals) of great early or late season fishing and value on Alaska's Kenai Peninsula. A couples and family Alaska Kenai vacation at a reasonable price. Inclusive 7 days / 6 nights and all meals, of Alaska adventure and relaxation. 6 nights lodging (all meals) / 5 full days of combo fishing in the salt and freshwater fisheries of Cook Inlet, Kenai River, Kasilof River, and multiple tributaries. of late season serenity and jumbo trout on the Kenai. Let Alaska Hooksetters help you personalize your Alaska vacation package based on season, fish run timing, your available vacation dates and your specific budget. See our build your own Alaska vacation page.